I went in search of inspiration of painted floors and I found a lot of white painted hardwood floors but not nearly as many black hardwood painted floors. We already have a lot of white painted furniture and I was concerned about the difficulty of keeping the white floors clean. I turned to Pinterest for inspiration and found these images that I really liked. 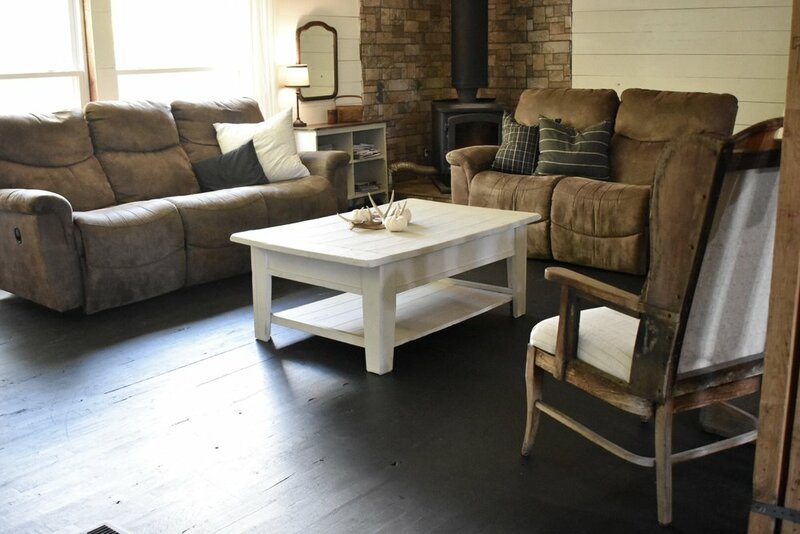 You can find more black farmhouse style on my Pinterest board. After finally deciding that I wanted to add a lot of contrast to our home, I decided to go with black hardwood painted floors. Here is how I painted our hardwood floors. 1. I chose to go with the Behr Premium Porch & Patio Floor Paint. I had previously used paint on our sub-floors after we bought our manufactured home and tore all the carpet out. The paint held up very well and I decided to go with the same type of paint again. When I purchased the paint, I chose the color Tar Black. 2. Our hardwood floors are #3 grade and had not had a finish put on them. So, I was able to just paint the hardwood flooring. I know a lot of people use a roller brush to apply the paint but I actually used a brush and hand painted every single board. I know that may sound extreme but I really wanted to control how much paint I put on the board. My goal was for the grain to still show through. 3. After applying the first thin coat, I waited 24 hours and applied a thin second coat. After I was finished with the second coat, I had achieved the look that I wanted. 4. I have not sealed our floors at this time. I am rather particular about the way I want the floors to look and I have not found a sealer that doesn’t have a lot of shine to it. I also want our floors to develop more character so that they look old and worn. I am not an expert and can only share what I have done in our home. I will continue to update with how well the flooring holds up to the daily life of six people. Our entire family loves the way that the floors have turned out and the black really pops against the white walls. Our manufactured home has come a long way in the remodeling process. It has been a slow remodel and we still have things to do in this room, including all the trim work and putting bead board up on the ceiling. I also plan to add an area rug and more decor. I currently have not put any finishing touches on this room, like the trim work as we are planning to move our manufactured home within the next couple of months. I will be answering questions in a future post as to how we keep our black hardwood floors clean because I was warned that they would show everything! I am happy to say that with our daily cleaning routines, I haven’t had any issues. Below is an image of our black hardwood floors. Our hardwood flooring shows a lot of character since they are #3 grade. So, what do you think? Do you like painted hardwood flooring or are you against it? I would love to hear your thoughts! Thanks for stopping by! Don’t forget to sign up for my newsletter so, that you don’t miss the latest news!